It's January which means its time to start rearranging rooms and getting ready for baby girl! Ever since finding out we were having a girl I've dreamed of floral, pale pink and gold for the nursery. Funny how our styles change, with Isabella I didn't love pink but this time around give me ALL the pale pink. I'm picky on the pink but I'm loving the soft, subtle pale pinks! I envision the wall behind the crib being all dark floral. I'm still debating between wallpaper or a custom painting, to be determined. I am OBSESSED with this gold crib, but of course just like this adorable rocking swan they once had, Pottery Barn is no longer carrying it. So I have enlisted the hubs to paint our Jenny Lind crib gold. I found some baby safe paint and can't wait to see how it looks! I ordered this adorable grey rocker last week, I've been obsessed with it since I saw it at Pottery Barn Kids over a year ago. It's so comfy and just what I envisioned. This pink pouf will be perfect next to it! 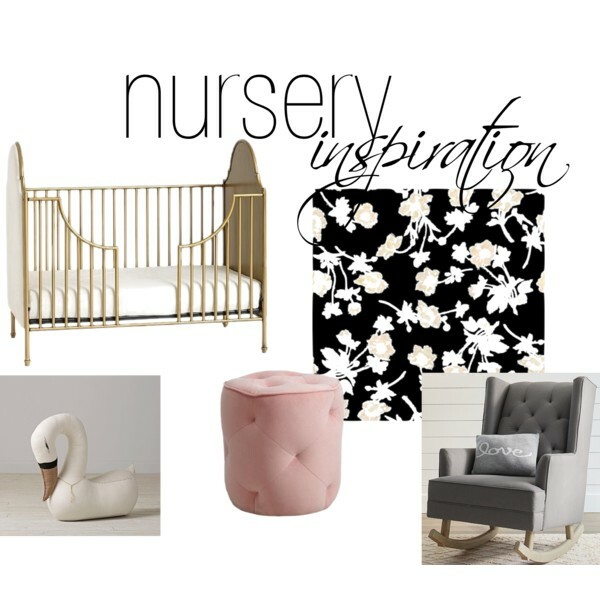 Since the rocking swan I fell in love with is no longer available I'm snatching up this, too precious for words, sitting swan from Land of Nod! I am on the hunt for the perfect brown antique dresser for the wall opposite the crib. I want a classic vintage look to it. I'm thinking just simple ivory curtains, maybe a little fiddle tree and hanging canopy and her sweet little room will be done. Now to just get moving!